Systemic lupus erythematosus (SLE), commonly referred to as lupus, is a chronic, inflammatory autoimmune disorder (Peng, 2004). In lupus the immune system makes autoantibodies against DNA, RNA, and proteins associated with nucleic acids. Lupus affects many different parts of the body because it produces autoantibodies against antigens found in every cell in the body (Janeway et al., 2005). Common symptoms of lupus include joint and muscle swelling and pain, fever, extreme fatigue, mouth ulcers, sensitivity to sun, swollen glands, and red rashes. A characteristic rash associated with lupus is a red rash named the “butterfly rash” across the nose and face. Lupus symptoms can range from mild to severe. Lupus can affect the kidneys, the lungs, the central nervous system, the blood vessels, the blood, and the heart. Lupus cycles through flares, periods of illness, and remission, periods of wellness. Physicians can diagnosis lupus with an antinuclear antibody (ANA) test. An ANA test identifies the presence of autoantibodies that react against components of the nucleus. There are also blood tests for other autoantibodies specific to those with lupus such as anti-DNA, anti-Sm, anti-RNP, anti-Ro, and anti-La(National Institute of Health, 2005). The cause of lupus is unknown, but scientists predict that its cause is likely a combination of genetic, environmental, and hormonal factors. Scientists hypothesize that susceptibility to lupus involves several different genes. The fact that lupus can run in families and the fact that lupus is three times more common in African Americans than in Caucasians suggest the involvement of a genetic factor in lupus(National Institute of Health, 2005). Further evidence of the role of genetics in susceptibility to lupus is data showing that there is an increased percentage of HLA-DR2 and HLA-DR3 in those with lupus. There is also a confirmed linkage of chromosome region 1q41-1q42 with susceptibility to lupus (Hawn et al., 2005). There is a 25-60% concordance rate of lupus between identical twins. This data provides evidence that lupus is not strictly genetic (Belmont, 2005). Lupus affects nine times as many women as men. This data provides support for a hormonal factor involved in susceptibility to lupus (Peng, 2004). Lupus primarily affects people age 15-45, but it can affect people older and younger than this age range. ( National Institute of Health, 2003). Surveys estimate that approximately 250,000 to 500,000 people in the United States have lupus. Worldwide, there are an estimated 6 to 35 new cases of lupus every year per population of 100,000 people (Belmont, 2005). In order for the immune system to work efficiently, it must have self tolerance, the ability to distinguish self from non-self. To establish self tolerance, developing self-reactive lymphocytes undergo deletion, receptor editing, or anergy. Despite these safeguards to establish self tolerance, some self-reactive lymphocytes mature and can cause autoimmune diseases. In autoimmune diseases, the immune system makes antibodies against the body’s healthy cells and tissues (National Institute of Health, 2005). Antibodies against the body’s healthy cells and tissues are called autoantibodies. In lupus, immune system autoimmunity results in the formation of antinuclear antibodies. The main antigens of these antinuclear antibodies are the nucleosome, the spliceosome, and the small cytoplasmic ribonucleoprotein complex made up of two proteins: Ro and La. These autoantibodies form immune complexes. Immune complexes are antigen: antibody complexes that form when an antibody responds to a soluble antigen. Immune complexes usually cause little tissue damage because they are efficiently cleared through the complement system. In lupus this system does not work because there are high levels of immune complexes due to the large quantity of antigens. In lupus the immune system produces large amounts of immune complexes that are deposited in blood vessels, joints, and other organs. This causes inflammation and tissue damage that release more nucleoprotein complexes which form immune complexes. This cycle also activates autoreactive T cells, T cells that react against the body’s healthy cells and tissues (Janeway et al., 2005). The origin of autoantibody production in lupus is unclear (Belmont, 2005). Several recent studies offer suggestions of the origin of autoantibody production in lupus. In lupus there is a breach of B cell tolerance that results in the expansion of autoreactive B cells that induce disease (Cappione et al., 2005). There are many tolerance checkpoints during B-cell maturation. Autoreactive B cells that escape tolerance could become autoantibody secreting cells. There are several possible points at which B cell tolerance could break down in those with lupus, and there is evidence that in lupus there is more than one defect in B cell selection that increases the survival of autoreactive B cells. In lupus, receptor editing may not eliminate autoreactivity. Co-stimulatory molecules could be overexpressed or dysregulated in a way that leads to survival of autoreactive B cells. About 25% of people with lupus have elevated levels of the hormone prolactin. Prolactin can increase the number of autoreactive follicular dendritic cells. There is a high concentration of BAFF (B cell activating factor of tumor necrosis factor family) in those with lupus. BAFF enhances the survival of autoreactive B cells in mice. BAFF could also enhance the survival of autoreactive B cells in those with lupus (Jacobi et al., 2005). There is also increased activity of protein phosphatase 2A (PP2A) in those with lupus (Cappione et al., 2005). In those with lupus, PP2A is at least partially responsible for decreased IL-2 in patients with lupus. IL-2 is necessary for both the promotion and the suppression of the immune response. Decreased IL-2 decreases activation-induced cell death which results in extended survival of autoreactive B cells (Katsiari et al., 2005). The formation of immune complexes made of antinuclear antibodies and the failure to clear them may affect the skin, joints, kidneys, and other organs. Lupus can result in inflammation of the kidneys, lungs, blood vessels, and heart. Lupus can also affect the nervous system and cause headaches, dizziness, memory problems, and changes in behavior. Anemia, leukpenia (a decrease in white blood cells), and thrombocytopenia (a decrease in platelets) can also result from lupus (National Institute of Health, 2005). Autoreactive T cells contribute to disease by helping B cells to make antibodies and by destroying target tissues (Janeway et al., 2005). Although there is no current cure for lupus, there are effective ways to treat lupus symptoms (Peng, 2004). With appropriate treatment, most people with lupus can maintain a high quality of life (National Institute of Health, 2005). Treatments for lupus vary because lupus has multiple symptoms that can range from mild to severe (Peng, 2004). There are also ways to reduce the risk of flares. Avoidance of excessive sun exposure and use of sunscreen helps to prevent rashes. Regular medical checkups help to ensure proper diagnosis and treatment. Regular exercise helps prevent muscle weakness and fatigue. Immunization prevents specific infection (Lupus Foundation, 2001). Mild forms of lupus require little treatment (Peng, 2004). Physicians prescribe acetaminophen to relieve mild pain associated with lupus. Nonsteroidal anti-inflammatory medications (NSAIDs) relieve muscle and joint pain and arthritis symptoms (Lupus Foundation, 2001). Physicians can treat lupus skin rashes with corticosteroid creams (Peng, 2004). Corticosteroids reduce inflammation and suppress the immune system. Physicians often prescribe antimalarials for skin and joint symptoms of lupus. Occasionally, for severe forms of lupus, physicians prescribe cytotoxic or immunosuppressant drugs that suppress inflammation and the immune system. After an episode of clotting due to lupus, physicians prescribe anticoagulants to thin the blood in order to prevent future clots. The earlier symptoms of lupus are recognized, the better they can be controlled. Early control of lupus symptoms decreases the amount of time a patient needs to take medications and decreases the chance of organ or tissue damage (Lupus Foundation, 2001). Belmont, Michael H. 2005. 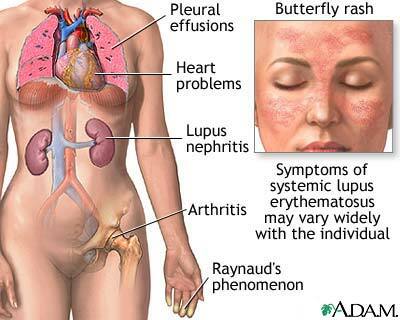 Lupus Clinical Overview. <http://www.cerebel.com/lupus/overview.php> Accessed 20 April 2006. Cappione, Amedeo, Anolik, JH, Pugh-Bernard, A, Barnard, J, Dutcher, P, Silverman, G, Sanz, I. Nov. 2005. Germinal center exclusion of autoreactive B cells is defective in human systemic lupus erythematosus. Journal of Clinical Investigation 15: 3205-3216. Hawn, Thomas R, Wu, H, Grossman, JM, Hahn, BH, Tsao, BP, Aderem, A. 26 July 2005. A stop codon polymorphism of Toll-like receptor 5 is associated with resistance to systemic lupus erythematosus. PNAS 102: 10593-10597. Jacobi, Annett M, Diamond, B. 1 Aug. 2005. Balancing diversity and tolerance: lessons from patients with systemic lupus erythematosus. JEM 202: 341-344. The Immune System in Health and Disease. New York, NY: Garland Science Publishing. Katasiari, Christina G, Kyttaris, VC, Juang, YT, Tsokos, GC. Nov. 2005. Protein phosphatase 2A is a negative regulator of IL-2 production in patients with systemic lupus erythematosus. Journal of Clinical Investigation 115: 3193-3197. Lupus Foundation of America. 2001. Treatment. <http://www.lupus.org/education/treatment.html> Accessed 16 April 2006. National Institute of Health. Aug. 2003. Handout on Health: Systemic Lupus Erythematosus. <http://www.niams.nih.gov/hi/topics/lupus/slehandout/> Accessed 15 April 2006. Peng, Stanford. 12 July 2004. Medical Encyclopedia: Systemic lupus erythematosus. <http://www.nlm.nih.gov/medlineplus/print/ency/article/000435.htm> 15 April 2006.